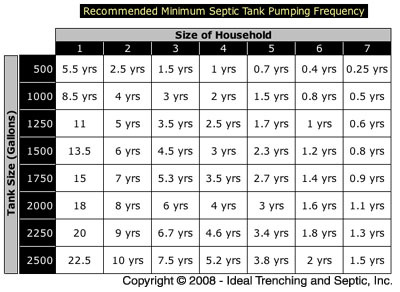 We are often asked how frequently septic tank pumping is required. There are many factors that determine an appropriate tank pumping schedule, the most important factors are the size of the tank and the number of individuals in the household using the tank. The diagram to the right depicts a typical septic tank cutaway. When a tank becomes too full of liquid, toilets will no longer flush, and waste water will backup into the home - causing damage and an unpleasant mess to clean up. In addition, if too much sludge (solid waste matter) builds up too quickly (faster than bacteria and enzymes can break it down) - the tank will no longer function. These key factors require regular pumping of the tank to ensure reliable and effective functioning. This chart provides a good guideline to determine appropriate tank pumping frequency. There are a number of contributing factors and individual use and circumstances may change accumulation rates, however, this chart provides a safe and proactive guide to base your individual estimate upon. We can provide an on-site analysis and a pumping schedule recommendation specifically for your needs - call us today to schedule a no-obligation visit.